Posted on September 15, 2006 by Alicia Bay Laurel	in Blog. Boy, can I relate to this page from Living on the Earth, even though I drew it 37 years ago. I’ve been nearly a week in bed with the flu. I am waiting for my vitality to return. I just finished reading Mezz Mezzrow’s Really the Blues, the autobiography of an early 20th century jazz musician and social justice advocate from Chicago. I drink Throat Coat tea, consume various natural remedies and sleep. Nothing works better than applying heat. Viruses die when the body’s temperature raises, so I press a heating pad to my sinuses and upper chest. The pain retreats. In my temporary quarters at my aunt’s house I am obliged to use dialup. What will slow you down better than that? One can meditate between page openings. 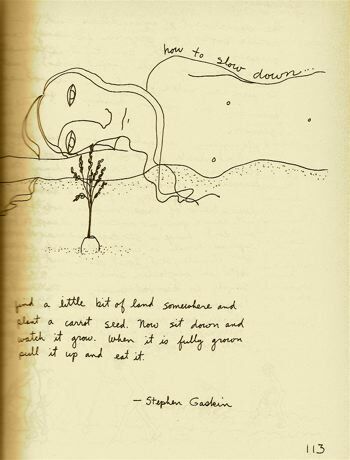 Stephen Gaskin, the author and philosopher from whose Monday Night Class in 1968 in San Francisco I picked up the quote above, lead the group that founded The Farm, arguably the largest, most financially successful, most charitable, most influential, and most long-lasting hippie commune in the world. I’ve got months of fabulous travels ahead, so I am going to take my time resting to let my body really get over this. ← Who Benefits from the Iraq War?